Numerous individuals on the beach. This series is of one individual except when it mates with a second. Moved from Bronzed Tiger Beetle. There seems to be some disagreement as to our identification of this tiger beetle. I do not know if it should be removed, left in place, or changed to another species. I do not want to have an image in the guide that is not correct because I know how great a resource the service is. Please give me some guidance on how to proceed. in Cicindela to await expert opinion? I would say C. hirticollis. Help me understand why? Those two look so similar to my untrained eye. Should I change the information on this page? on the humeral/shoulder in repanda is 'C' shaped. In hirticollis the first maculation points/curves up back toward the head. 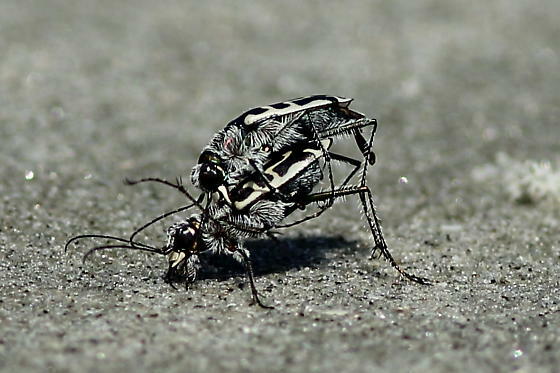 Other features are, hirticollis common name is the 'hairy necked' tiger beetle due to the amount of setae/hair on its neck, the mandibles are longer and they usually are slight larger 12-15mm in length where repanda is usually 10-12mm. Hope this helps. And so you would conclude that this is a _______? What do I need to do to make this record correct? Since it was moved into the wrong species, what do I need to do to make this record correct? below the image select 'Edit' then make the necessary corrections/updates then Post. Again below the same image select 'Tag', the image should show up in the upper left. Type hirticollis in the upper right search bar. This will bring up images of insects named hirticollis, select an image of a tiger beetle. Above the image you will see a drill down menu, Home, Guide, etc. Click on the last one it should say Hairy-necked Tiger Beetle (Cicindela hirticollis) click here. This takes you to the 'Info' Tab page. Select the 'Image' tab next to the 'Info' tab, then select the 'move tagged images'. This should move the image you tagged and all the other photos from your post. Worked, thanks for your guidance!